ChristmasMusicSongs.com, free Christmas sheet music for over 25 different carols. The Christmas Flute Duet Book arranged by Kyle Coughlin features twenty five of the best known and beloved traditional carols -- one for each day leading up to Christmas. The book includes the following songs. Select one of the free samples to try out the duets. The carols are written specifically for the flute with beginner and intermediate students in mind, and they progress in terms of difficulty. 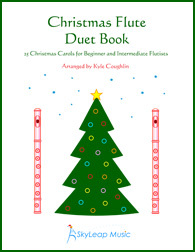 The Christmas Flute Duet Book is unique in that there are at least two versions of every carol in the book. The first version of each song has the melody entirely in the top line of the flute parts. These arrangements are good for featuring students playing along with their teachers. In the second version of each song, the melody is traded back and forth between the two flute parts. These arrangements work well for two students playing together, since both flutists will have an opportunity to play the melody. They can be used as an educational tool to help students identify when they are playing the melody and when they are playing the accompanying harmony part. Besides using the duets for two flutists, the arrangements can be played by flute ensembles in two parts. At the end of the book there are four extra carols for more advanced players: two more arrangements of Jingle Bells, and one each of O Christmas Tree and Silent Night. The book has a total of 55 arrangements of the carols and is 63 pages.